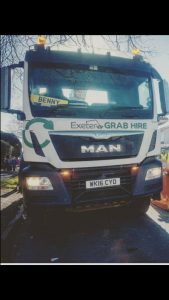 Last week we caught up with Benny Myers one of the Coastal Recycling drivers to find out what a ‘normal’ day looks like and what makes the job. So Benny how long have you been working for Coastal Recycling? I’ve actually been here nearly 6 years, I started working in the yard at Kenbury Wood and then in 2014 put myself through my rigid driving test so that I could move in to the vehicle side of things. There’s so much variety, over the years I’ve worked across pretty much all of them from skip lorries, ROROs, road sweepers, dust carts, the artic and also the grab. Although we tend to stick to one thing it’s good to be able to jump in and help when needed. I tend to stick with my grab lorry and it’s nice to use the same vehicle each day, we all do little things, so we soon know if anyone else has driven our vehicle. We’ve got a lot of new vehicles here as well; 16, 17 and 18 plates so it’s great having good kit that is comfortable, especially when you’re spending most the day in it. How far do you travel on a working day? It’s really varied, some days it will be in the Exeter area other days we go as far as North Devon, Cornwall and even Bristol. Have you had much opportunity for training? Definitely! Just a couple of years after I completed my rigid training Coastal put me through my artic license and also clam shell training so there’s always opportunity. We have regular reviews as well where they ask if there’s any new skills we’d like to learn and where possible they make it happen, they’re really keen to get people learning new skills. I’m contracted to work from 6am – 3.30pm, Monday to Friday but there’s always overtime on offer for those that want it. Without a doubt it’s the other drivers, we work hard but we have a laugh as well. It’s great knowing that if you’ve got a problem you’ve always got someone around who can help you get it sorted. Are there social events for the team? Yea, there’s always something going on, recently we’ve been paintballing and go karting, we’ve also got a curry night coming up. It’s nice to spend time with everyone outside of work socially. Fancy joining Benny at the team? Come along to our recruitment open day on 1st December. Find out more.